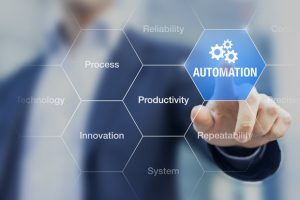 One area in which federal government agencies are actively investigating automation is through robotic process automation (RPA). “Robotic process automation (RPA) is the application of technology that allows employees in a company to configure computer software or a “robot” to capture and interpret existing applications for processing a transaction, manipulating data, triggering responses and communicating with other digital systems.” The General Services Administration has identified 41 possible RPA candidates and is actively considering eight candidates for pilots in the article “What Federal Job Automation Looks Like” from the September 18, 2018 issue of Federal Computing Week. If you are a professor who wants to introduce your students to RPA or a student who wants to teach themselves about RPA, you can download free RPA software to experiment with from WorkFusion. The software requires no knowledge of coding and provides plenty of tutorials. Public administration students can learn the power of RPA. Students can also learn the limits of automation. Meredith Broussard details the limits of artificial intelligence in “Artificial Unintelligence: How Computers Misunderstand the World.” One particularly powerful example of Broussard’s book is a tutorial from the online data science site, Kaggle. Kaggle hosts data science contests from various organizations in which data scientists (amateur and professional) compete to create the best algorithms for cash prizes. To help prepare data scientists for the competitions, participants can download practice data sets to sharpen their data analytics skills. One practice data set is the passenger list from the Titanic. The goal is to predict which passengers survived and which passengers died in the sinking of the Titanic using characteristics such as gender, type of ticket, and age. Broussard explains how to set up the artificial intelligence routines to train an algorithm to determine who survived. SPOILER ALERT: the characteristic that best predicts survivorship is the type of ticket. First class passengers have a better chance of survival versus passengers in steerage. In 1984, Dr. Philip Tetlock was appointed to the National Research Council of the National Academy of Sciences. He was part of a group devoted to discovering how to help the world avoid nuclear war. As he listened to experts on all sides of the political spectrum, Dr. Tetlock wondered how effective experts are in predicting the future. Over 27,450 predictions were collected from 284 experts as Dr. Tetlock tracked how well the experts predicted the future. In general, the experts were about as effective as randomly guessing future events. The experts who did the worse were the “hedgehogs.” These experts are not comfortable with complexity and uncertainty. The hedgehogs attempt to create a core theoretical framework which the expert uses to reduce the amount of evidence to a few pieces of data. As Dr. Tetlock found, the political beliefs, level of education, and access to information made no difference in the accuracy of predictions. It was whether the expert’s thinking style was a fox or hedgehog. In the quest to automate federal government work, it is important to remember the limits of artificial intelligence. When automating government processes, officials should consider how to utilize artificial intelligence best to augment human decision making. Automation can enhance decision making but should not replace humans in the decision process. That is because, at this stage of artificial intelligence technology, we can create effective digital hedgehogs – specialized algorithms effective at making good decisions in clearly defined environments. Artificial intelligence technology has yet to create a digital fox that can understand the nuances and complexities of dealing with citizens.